Lakes Hume and Mulwala are important recreational fisheries, with Lake Mulwala considered one of the premier Murray Cod fisheries in Australia. Lake Hume is a mixed fishery enabling anglers to target Trout, Redfin Perch, Carp, Silver Perch and Golden Perch throughout the year and Murray Cod during the open season. 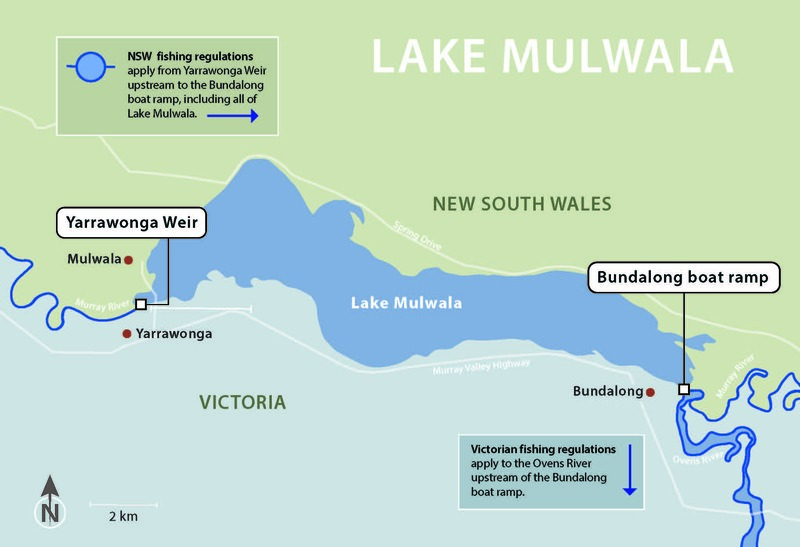 Previously both NSW and Victorian fishing rules applied to Lakes Hume and Mulwala, as the constitutional border between the two States runs through the two lakes. However, the location of the State boundary line made it very difficult for anglers to identify the exact position of the border and to comply with differing fishing laws. Anglers also needed to hold both NSW and Victorian fishing licences when fishing on the lakes. To resolve cross border confusion and to make it easier for anglers to know and comply with fishing rules, an agreement was reached for a single State to manage recreational fishing in each lake. From 1 September 2004, Victoria assumed control of management of recreational fishing in Lake Hume and NSW assumed control of management of recreational fishing in Lake Mulwala. As such, Victorian fishing rules apply to all parts of Lake Hume, from the Lake Hume Weir wall upstream to the Seven Mile Creek junction at Talmalmo and only a Victorian recreational fishing licence is required (unless exempt) to fish on the waters of Lake Hume. Similarly, NSW fishing rules apply to all parts of Lake Mulwala upstream from the Yarrawonga Weir wall upstream to the point where the Ovens River enters the Murray River, marked by the Bundalong boat ramp and only a NSW recreational fishing licence is required (unless exempt) to fish on the waters of Lake Mulwala. 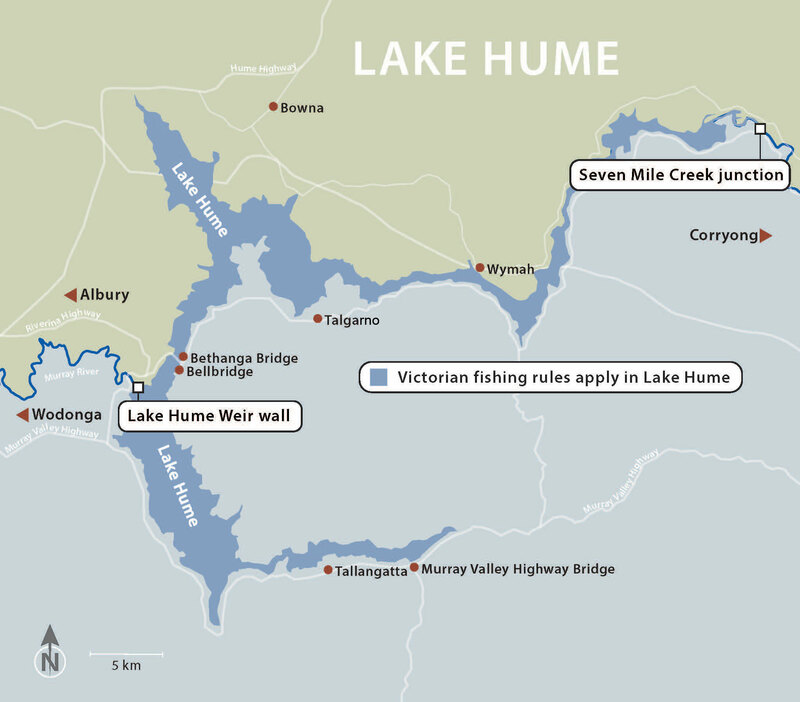 The fishing boundaries for lakes Hume and Mulwala are shown in the diagrams on the following page. In waters surrounding Lakes Hume and Mulwala, including the Murray River, the current State laws apply. NSW fishing laws apply to the whole of Murray River to the South Australian border (excluding the waters of Lake Hume). As such, the waters upstream of the Seven Mile Creek junction in Lake Hume at Talmalmo and the backed up waters of Lake Mulwala form part of the Murray River, which come under NSW Fisheries regulations. Victorian fishing regulations apply in waters south of the Murray River. NSW recreational fishing licences can be purchased from many outlets throughout NSW, such as fishing tackle shops, caravan parks, service stations, many Kmart stores, via the Service NSW website or call 1300 369 365. Victorian recreational fishing licences can be purchased from Fishing tackle shops, Department of Economic Development, Jobs, Transport and Resources offices and other recreational fishing licence outlets or via Victorian Online Recreational Fishing Licence.